Al Gore was born in Washington, D.C., where his father, Al Gore, Sr. was the U.S. Senator from Tennessee for 18 years. Gore would go venture into politics himself and served as Vice President of the United States from 1993 to 2001, during Bill Clinton's turn as President. 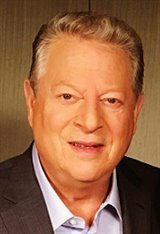 A longtime environmentalist, Gore released the movie An Inconvenient Truth in 2006, which foretold the dire results of global warming due to greenhouse gas emissions. In 2017, he released a sequel, aptly titled An Inconvenient Sequel: Truth to Power , which showed what changes had been made since the first movie and gave a hopeful outlook for the future. Gore married Elizabeth "Tipper" Aitcheson in 1970 and had four children together. They separated in 2010.